A shorter update this week! As I've said before, my course is three days a week. However, this week I had the first day off sick (chest pains, long story, I'm not going to die) which meant I missed out on a third of the teaching this week. I was SO upset and annoyed! Honestly, I kept trying to leap out of bed and go, but I was just in a bit too much pain. I was miserable. I didn't want to miss a day and it's only been four weeks and I've already missed one! So that's one reason why this post is shorter (although at this rate I'll blah blah blah it into a longer one). The second day I was in a terrible mood, partly because of the pains and partly because (we're all/mostly girls here right?) of PMS. I was far too angsty to be normal me and take photos and absorb every little detail. HOWEVER by day three I was pretty much me again, thank goodness because that was not an enjoyable two days. So yeah. I thought I should explain why this won't be as long and info-filled as the previous three weeks ☺. On the day I missed they apparently started a new assignment and practised liquid and powder on fake nails. I was pretty gutted I missed that! On day two, which I was there for, we continued on with the assignment (just theory stuff) and at first I didn't understand it - cue bad mood. However I realised I was over-complicating it and it's now all done and handed in. For the rest of the day we practised doing a full manicure! This was awesome, I love doing the practical stuff and from next week onwards it'll almost all be practical. We had a big list of the things we needed to remember, and I teamed up with a friend to do it. I think we did well, although we had to keep looking at the sheet to remember the order of things. My nail care routine at home is just filing, cutting off hang nails and copious amounts of cuticle oil, so this is going to take some getting used to. On day three we had Smiley (see the last update if you don't know who this is) and we started doing actual acrylics! SO happy about this, but god, I am SO awful at it! Haha, I wasn't the only one at least. My main problem was that I didn't put enough glue on the tip I was sticking on to my friend's nail, so when I started filing one side popped up. She did well sticking mine on though! I'm the thumb in this picture, my friend Shayla is the pinky. Then we finally got a go at applying the liquid and powder, YAY! Neither of us were great at it, and these photos are to compare to photos in a few months time, when we are good ☺. Note the bright orange road cone-like thumb nail - they have inspired my current manicure! Tutorial and design should be up within the week. We also learnt about contra-indictions and more about consultations this week. Oh, and I went to a meeting! A lady from the NZ Association of Registered Beauty Therapists came to visit us, and invited us to a meeting that was happening that night. Me and a few other girls from my class went, and it was really interesting! I'm going to try to go every time now, it's a good way to keep in the know and meet new people in the industry. The weirdest thing about the meeting was that one of the higher-up people from my old job (early childhood) came and spoke. It was so weird! He comes round checking all the centres every month, so I've seen him around quite a bit and associate him with that, but then he's at my beauty meeting and I was so taken aback! He did a really interesting speech about generation Y (that's me!) and how we're basically a pain in the a** to teach. Well, not really, but it was funny and very true. I'm quite proud to be a Gen Y person though, despite the negative bits. Technology, tolerance and confidence, I like that. Also, there was fantastic food at the meeting. All the polite beauty ladies just got one thing and pecked at it but Shayla and I pretty much devoured the whole table. So good. So ladylike. So nom. This post is becoming a lot longer than I thought! One more thing before I move on to the facts I learnt this week... I HAVE A NEW JOB! In the industry! Actually, I have for ages but there have been lots of things to sort out. I'm not saying where it is yet, but once I'm all trained up I'll be letting everyone know so they can come see me for the prettiest nails around! I'm in Palmerston North, if any New Zealanders are wondering ☺. Keep an eye out on my Facebook page for updates. I had 2 1/2 hours of training on Friday night, and going back next week to learn gels! Then it's just increasing my speed and confidence. 1. When layers of your nail peel/flake at the ends it's called de-lamination, and is caused by the nails being dried out too much. There is natural "glue" between the layers of keratin and excess water, polish remover, tapping and the like makes the glue break up and become separated. Use cuticle oil, and avoid excess amounts of the anything that could dry out your nails! 2. Skin type is commonly the same as the nail type. For example, if you have oily skin you probably will have oily nails. However, as you get older your skin tends to dry out, so your nails may be different than your skin type after middle age. Teenagers tend to have oily nails, and the nail has to be really well dehydrated before applying polish. 3. I have a lot to learn, and need a lot of practise. A LOT. But between my new job, my course and practising on friends at home, I will hopefully be pretty good by the time I move to Auckland at the end of the year. 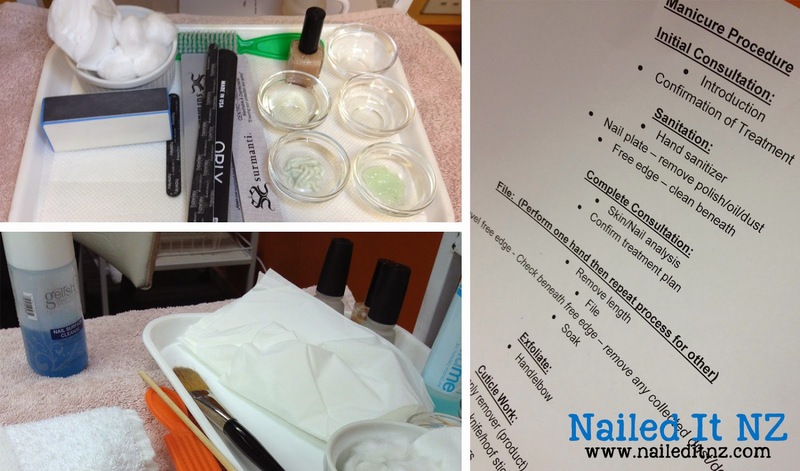 If you haven't read my previous nail school diaries, you can find them here. Hopefully it'll help anyone who's considering training in the industry! I've just finished editing a video about why I chose to go to nail school, and I'll probably add that to the next update. Also, I don't think I'll be able to add that video I talked about last week because of privacy issues... but I'll talk to my teachers and get an official answer asap. I need to also figure out what I can and can't say and take photos of. I know these posts help a lot of people who are looking into the industry, and could potentially be good promotion for my course... just the details need to be sorted! Thanks for reading, and I hope you found this post interesting! It sounds like you learned a lot this week. I'm excited to see your improvements after you finish with your program too. You seem to be doing awesome so far. Jessie, you have really been educating ME these last weeks with your nail school diaries. Thanks for all these interesting posts! 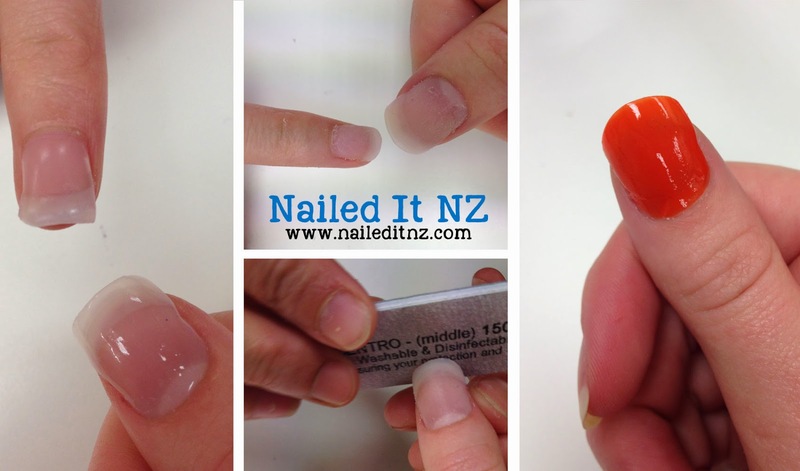 Who ever knew about all the technical stuff that goes into nails?? And I'm so glad you're taking photos now, when your work is in its infancy, so we can compare how much you improve with practice. Those acrylic nails sure look hard to get the right shape!